OPTIMAL SYSTEMS provides dedicated enaio® interfaces for Microsoft Dynamics NAV and Dynamics AX, each of which extends the respective solution with audit-proof archiving or receipts, sophisticated document management, and digital workflows for incoming invoice processes, release procedures, and other jobs. NAV or AX receipts thus become part of a comprehensive and searchable ECM document pool that includes correspondence, Office documents, e-mails, presentations, and much more. For you this translates into faster receipt processing and searches. Moreover, the ability of your employees to provide information increases substantially. enaio® consistently bundles documents, data, and processes in a single e-record. 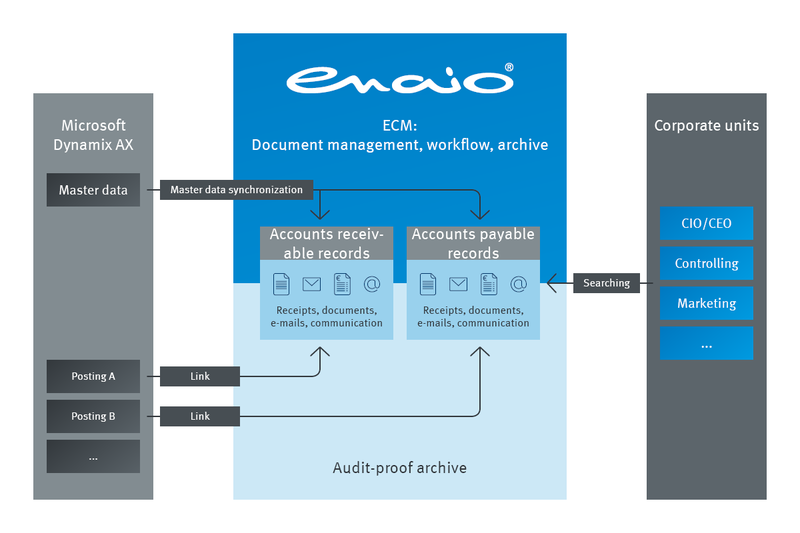 enaio® archives your documents and data. For simple handling across the company. enaio® offers tested interfaces for many popular ERP solutions. The enaio® dynamics ax interface integrates Microsoft Dynamics AX with enaio®, adding audit-proof receipt archiving functiona­lities to AX. Furthermore, this integration means that you can use enaio® workflows to implement incoming invoice or release processes, among many other applications. AX receipts thus become part of the comprehensive, enaio® document pool that can be searched across the entire company. enaio® seamlessly integrates with Microsoft Dynamics NAV, thus adding useful functions to the ERP system such as audit-proof receipt archiving. You can also use digital workflows for customers, vendors, and receipts to implement functions, including incoming invoice processing or release processes. Receipts become part of a comprehensive and searchable enaio® document inventory that can include correspondence, Office documents, e-mails, mind maps, presentations, photos, and drawings. The information can be collated in electronic records easily and conveniently thanks to preconfigured record templates provided by enaio®. Scan incoming documents in enaio® and allocate them to NAV postings. Technically, we got all we hoped for and more. Many solutions were even customized to meet our needs to the dot. Our digital drawing archive contained approx. 160,000 drawings, plus ERP evaluations, a paper filing system, and the old PPS with over 220,000 work plans, 185,000 parts lists, and 19,000 main orders.